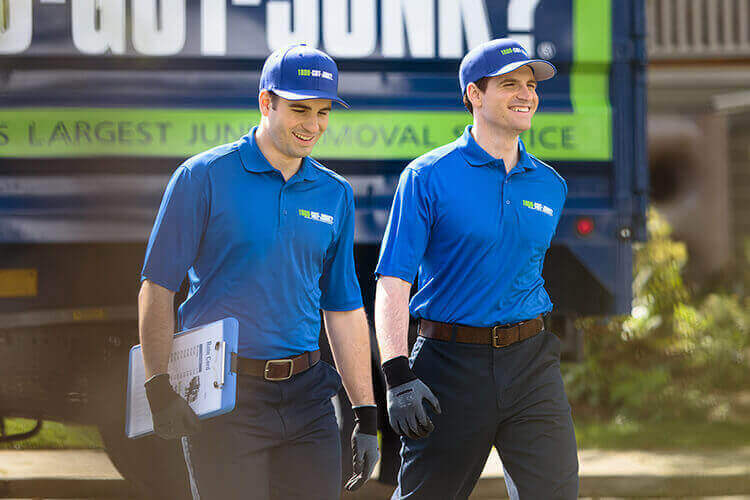 Electronics Removal & Recycling | 1800-GOT-JUNK? Technology is rapidly changing, which means we all inevitably end up with out of date or broken electronics (e waste) that we need to get rid of. But it’s not as simple as throwing it in the rubbish. These items often contain hazardous materials and should be recycled or disposed of properly to avoid doing damage to the environment. That’s where 1800-GOT-JUNK? comes in. We’re experienced in providing electronics removal and are happy to help get those old items out of your way. Our friendly team of professionals will ensure that your e-waste gets donated to organizations and charities in need, or sent to be refurbished and recycled as much as possible, leaving only a minimal amount to be safely disposed. If you need electronics pick up, give us a call and we’ll take care of everything for you. All you have to do is point! We will handle the rest. What is e-waste & how is it recycled? Technology is ever-changing, which means many people end up upgrading their phones, computers, and televisions more frequently than ever before. This leaves many of us with a stockpile of outdated technology in our homes, which we call e waste. At 1800-GOT-JUNK?, electronic waste recycling begins with a proper disposal method. Once we pick up your unwanted electronics, we sort through everything to determine where to take them next. First, any pieces that are still in working order will be donated to local charities so they can extend their life cycle with a new owner. Any broken or not-working items will be taken to designated recycling facilities for further processing. How is e-waste harmful to our environment? Old electronics are made up of more than just bits of plastic, glass, and metal. What you might not realize is that they also often contain toxic metals and chemicals such as lead, mercury and cadmium. This is why proper e waste disposal is so important. When these items end up in the landfill, these substances can make their way into soil, causing damage to plants and animals, as well as potentially impacting our food and water supply. This begins a cycle of exposure to these harmful substances that is hard to break—once they’ve contaminated the soil or water, it can’t be easily restored to its natural state. You can help prevent this by ensuring proper disposal of your e waste through a recycling process where precious metals and plastics within e waste can be reclaimed and reused. At 1800-GOT-JUNK?, we take care of this for you. We work with recycling facilities to ensure everything is broken down and disposed of responsibly. Can I Just throw a mobile device in the bin? You might think that once your TV, computer monitor, or other electronic devices stop working that you are safe to just throw it in the bin like you do with regular household rubbish. What you might not realize is that doing so is very harmful to the environment and could be potentially dangerous. This is because many electronics contain harmful chemicals and metals that are very damaging to the environment. You can do your part to keep these items out of the landfill by calling 1800-GOT-JUNK? to help you with your electronics disposal. How do I properly dispose of broken electronics and e-waste? There are many ways you can get rid of old electronics and e waste. How you get rid of them largely depends on the condition they’re in. For items that are still in working order, donating them is a great option. There are many charities that accept working electronic goods to reuse or sell. This is a great option, since it grants access to electronics to people who might not be able to afford new ones, and it extends the life of perfectly good items. For items that no longer work, you can bring your e waste materials to government offices or schools who recycle them or you can drop off goods at an e waste certified recycler. Of course, you can also call 1800-GOT-JUNK? and let us handle it for you. We work with local charities and recycling facilities to ensure these items are kept out of landfills. What percentage of e-waste goes to the landfill? According to Clean Up Australia, e waste is one of the fastest growing contributors to global waste. 88% of the 4 million computers and 3 million TVs bought in Australia end up in the landfill. In addition, fewer than 1% of the TVs and around 10% of PCs and laptops are recycled Australia-wide. Electronic waste sent to the landfill represents 3 times the rate of general waste in Australia. At 1800-GOT-JUNK?, we’re doing our part to help keep these items out of landfills. We work with local charities to donate electronic goods in working order so they aren’t just thrown out before their time. We also work with local recycling facilities to ensure all the recyclable components are broken down for reuse, and any hazardous materials are properly handled. Learn more about What We Take and the 1-800-GOT-JUNK? Environmental Vision .